Buying the right gift for a child can give them joy now and in the future. 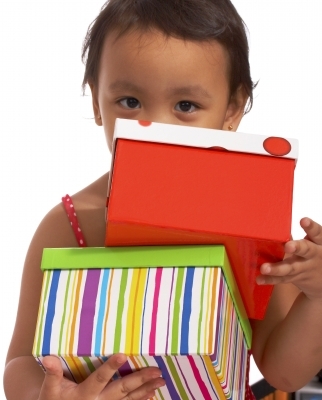 Use these 4 ideas to buy presents for kids. Although you want your child to enjoy a gift buying something practical can serve multiple purposes. Seek out an appealing, enjoyable and functional gift. For example, creating storage space in a child’s bedroom can be achieved by gifting your kid’s neat-looking furniture. They’ll be happy to have a cool gift for their room and you’ll be happy to see less clutter and to make both of your cleaning jobs easier. Storage, linen, undies, singlets and other practical gifts help to makeover a bedroom or wardrobe as your child grows through certain stages. Make the gifts more appealing by buying presents with your child’s favorite animals or characters. Talk to other parents if you’re buying gifts for their children to get an idea of what they like. An educational gift is a present for now and for the future. Any gift which inspires a child to use their brainpower is a kind, generous present which will improve their life in many ways. Kids can have fun and learn at the same time with craft sets, books and educational CDs. Buy gifts which teach in an entertaining manner. Small children need some fun, playful aspect of the gift to draw them in. You can make learning fun and expand minds in the process by purchasing educational gifts. Give children an educational and mental workout by buying something which can benefit them now and in the future. If you want to reward a child more than once consider buying a subscription to a toy library so toys can be swapped throughout the year. Think of picking up a gift that truly keeps on giving. Although receiving a toy at Christmastime can be thrilling many kids outgrow toys within months of receiving their new gifts. By purchasing a subscription the child can get new and exciting toys as they grow through different stages. Magazine subscriptions or passes to the local pool can keep a child’s mind and body fit throughout the year. This is a nice option to the temporary joy a child experiences after unwrapping a onetime present. In a few months they’re less likely to be as enthusiastic about the gift. Although everybody wants to be the parent, aunt, uncle or caring adult friend who lavishes kids with gifts you may rue your credit card bill in the following month. No need to break the bank to create a wonderful experience for your child. Make a magnetic blackboard from an old cookie tray for hours of fun or simply offer a delicious sweet treat of homemade chocolate chip cookies, chocolate truffles or coconut macaroons to win your way into your child’s heart. The thought and intent counts more than anything when you decide to buy a gift for your child. Pick up Animationshop.com’s signature big face T-shirts for a fun and creative children’s gift idea.